As the civil war continues, millions of Syrians are seeking refuge in other countries. As expected, there can be a lot of red tapes involved, and those looking to help immigrants will need to ensure that some form of translation is in place. Gaining access to a country is very rarely straightforward, and in many instances, there can be confusing documentation to contend with, which is impossible for many Syrians to contend with alone. Although there are many volunteers keen to invest their time helping refugee, the process can be simpler if a translation service is in place. There’s also the fact that during these times, those seeking asylum can be scared and worried, and a translation service could make all the difference as to their welfare moving forwards. Syrians aren’t restricted to one location when it comes to escaping Syria, so refugees can be found in countries such as German, Egypt, and Turkey. As you can imagine, there can be a lot of barriers in relation to communication, and the process can be made more complicated than it has to be. Simply returning to Syria is not a viable option for many, and the majority feel they will be viewed as traitors and suffer the consequences that come with this. In some instances, those seeing refuge may not even have their own interests at heart, but rather that of their children. During such an upsetting and emotional time, reassurance can only be made with the right translation service in place. Although some may have a basic understanding of the language, only a true professional can ensure that the translation is verbatim. Given the upsetting circumstances surrounding Syria at the moment, it should come a no surprise that people have been keen to aid where they can. Many of those seeking aid will speak very little, if any, English. As such, it’s important that a professional translation company is used to ensure that there is clarity when engaging in conversation. FutureTrans has been offering Arabic translation services and other language translation and localization services for over 20 years, and in that time has built a positive reputation as well an in-depth knowledge revolving around translation and localization services. Some translation services can be limited because of the sector they’re required in, but this isn’t the case for Future Trans. 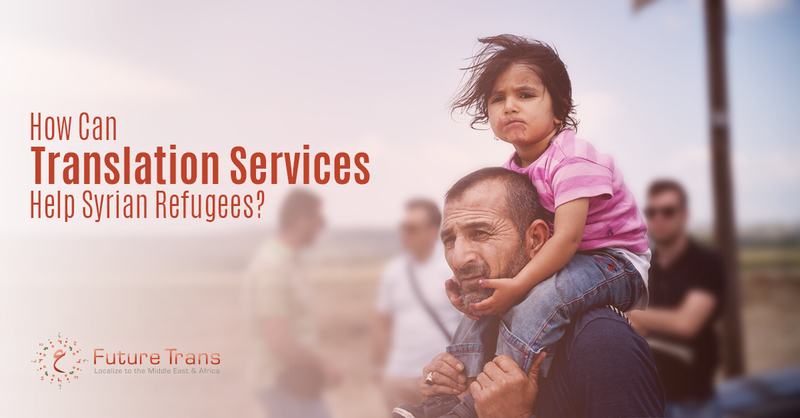 It has been able to aid several industries, including automotive, information technology, legal and of course aiding those looking for translation services for Syrian refugees. This ensures that any paperwork is streamlined, and a resolution can be sought sooner rather than later.